Mapping historical storms data is now a little bit easier. 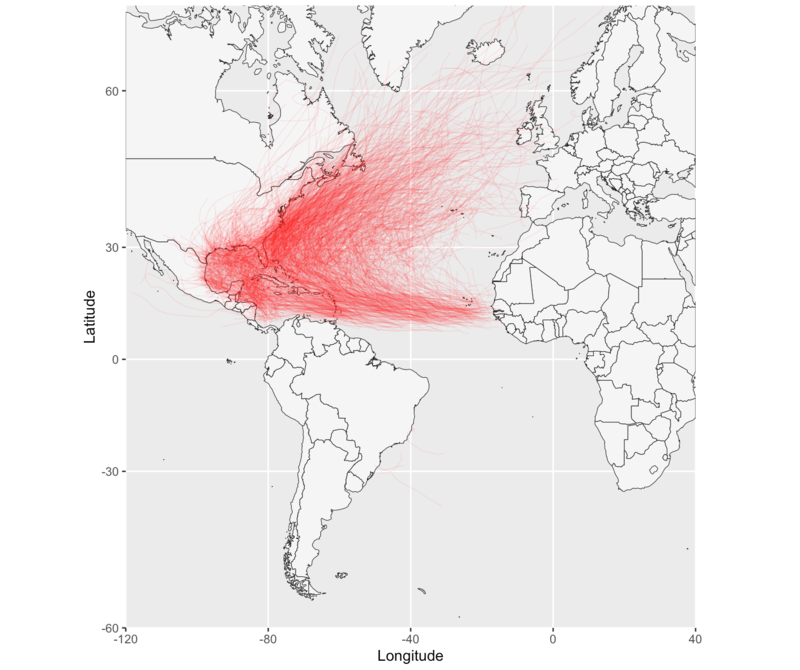 Off the back of this blog, I have authored an R package (available at basilesimon/noaastorms) that downloads, cleans and parses NOAA IBtrack data for you. The National Oceanic and Atmospheric Administration releases datasets known as International Best Track Archive for Climate Stewardship. These datasets are updated regulary and cover all our oceans. The data found in there is fantasticly detailed and goes back as far as 1850 in some case (I wonder how!). To get storms that took place in the Atlantic for example, run getStorms(c('NA', 'SA')). Will query storms that took place in the Atlantic in 2010 and 2012. Next on the list are more complex queries. Sadly, supporting date ranges doesn't change how much data we need to download (the NOAA data is bulk export). I maintain a list of open issues on Github and hope to capture some feature requests there. If you have ideas, bug reports, feature requests, this is the place to go. Thank you!